Yandex is the one of the most popular Search Engines mainly in Russia and neighboring countries.It offers service similar to Google Webmasters known as Yandex Webmasters.I have written separate tutorial on Google Webmasters and Bing Webmasters.It is better to leverage Webmasters services offered by Yandex. Most of the website owners ignore Yandex Webmasters.But it is good to use it.Is not it good to have decent traffic from any source possible.The big reach of Yandex in Russia and surrounding countries will bring decent traffic if optimized well for Yandex search engine.I will cover features offered by Yandex Webmasters in this step by step tutorial. You just need to enter URL of your website.After adding your website next step is to verify your website.For verification you need to download file and upload it to your web server.It is the easiest method of all.After verification you can proceed with other options offered by Yandex. Site Structure displays structure of your website in eyes of Yandex.It is the way Yandex robots visit your site. This options shows all the URLs from your website available in Yandex indexing.You can also check specific URLs of your website for inclusion in Yandex indexing.It is important to have your pages indexed in Yandex. This option displays external links to your website as well as internal links to your website.You can also enter a specific URL from your website to see internal links or external links to that website. Server or Site Error.If there are multiple occurrences of these errors then you should check your server configuration. Pages which are blocked by Noindex tag or robots.txt and pages not found on your website.You should minimize these issues. It shows number of times or number of requests Yandex made to your website.It also shows any issues like connection issues or DNS issues faced by your website.If these issues are present then you should minimize them or end them. HTTP code is response send by your website (server) to Yandex.HTTP response 200 means OK.So you should check this section if there are any other response codes from your website. It shows pages indexed by Yandex over a period of time.If number of pagse on your website is increasing with time (which is the defualt case) then the number of pages indexed by Yandex over a period of time should increase as well. It shows number of pages from your website available on Yandex searches over a period of time.The number should on increasing side with time.So you can get an idea if there is any potential issue in your site which is causing decrease in number of pages in Yandex. Above we saw Yandex shows list of external links to your website.This option helps you get idea of count of external links over a period of time.The number should be constant or increasing in linear fashion.If there is sudden surge in external links then you should see if there are bad links pointing to your website. You can also add URLs to check if Yandex is allowed by your robots.txt to index them.In case it is not allowed then you need to modify your robots.txt file. 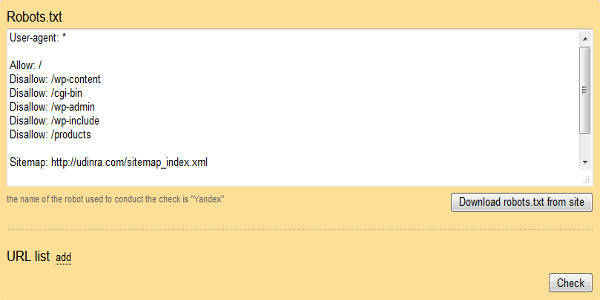 You can use this option to add sitemaps.Yandex as of this writing does not recognize Image Sitemap tags.This is big restriction.So you can create a generic web based sitemap file for Yandex and submit it.You can also create a text file with links of all your pages and submit it.You should verify your sitemap before submitting it to Yandex. In case you are using WordPress then sitemap created by WordPress SEO by Yoast does give warnings with Yandex validator.So instead of adding Sitemap file link created by this plugin you can create sitemap file as mentioned above. Every website can be accessed using two URL one with WWW and second without www.You can use this option to tell Yandex which version you prefer.I prefer non www version.You just need to select the version you prefer and save the settings. You can select regions for which you need the statistics to be displayed in Popular Queries section above.This feature proves beneficial for Sites targeting a specific city or locality.It may not be useful for blogs or other similar website. Yandex allows you to set up to 500 keywords for which you want granular details in your website traffic reports.This feature is not available in other webmaster tools like Bing or Google. In case you have E Commerce website targeting specific location then you can mention that in this option.For blogs and forums not targeting a specific location you can choose the option This site does not have a regional affiliation.You can mention Site Region depending upon your requirement. This is one feature which is not available in Bing Search or Google Search.Using this feature you can make your search result interactive.This may not be applicable for all types of websites.But for pages which need user input for next course of action can certaily use this feature.It will help them increase Click through rate. To implement Interactive answer feature you need to add mark up tags on your website.After adding the markup you can validate that using Yandex validator present at this option.After the validation is successful you can add the page here.Since this is new and long topic I would write separate post covering this option. It is yet another feature offered by Yandex which is not present in Bing or Google.You can modify URL letter case of your website.Every other search engine (Bing and Google) show URL in lower case.But with Yandex you can change that.For example I set this website URL as Udinra.com (U in capital). This change makes my website domain name look beautiful.But Yandex needs to approve the changes you are making to your domain name.It should not look like that you are unnecessarily promoting your website. Malware is worst enemy of your website.The best thing is all the major search engines are notifying websites about possible Malwares on their site.Bing has similar feature,Google has similar feature and Yandex has also similar feature. As a website owner you need to take immediate action to make your site free from Malware.You should take your website down if infected by malwares.After clearing your website from malware you should bring your website online.